A prospective student phoned me recently informing me that he had studied martial arts for some years and was now ready to do "something spiritual"! It brought to mind a case in the news a little while ago about a yoga teacher who was told by the church where she taught that she would have to find a different room. Yoga teacher Naomi Hayama was outraged at the suggestion that she was doing a "spiritual" discipline: "They are trying to say it is a spiritual practise but my classes are not… I respect people who are religious but I am not. That's what attracted me to yoga”. I was tickled by the response of a friend of mine (who happens to be an Indian guy and a committed yoga practitioner) on Facebook who dryly commented that, "900 million Hindus might disagree". In one of the featured articles in the book Asian Martial Arts: Constructive Thoughts and Practical Applications, Michael Maliszewski Ph.D. revisited a ten year research project he had previously completed dealing with meditative practices and indigenous healing traditions associated with many Asian martial arts. Some twenty years since his work was published he believed, “there had been a decline in the depth that has characterised the more traditional systems. The spiritual or meditative focus is more “generic” in the sense that any loose association with the ethereal is deemed spiritual”. Maliszewski concluded that, “in general martial arts study today, practitioners do not have the dedication to endure the long hours of training required to reach a level of authentic mastery in a tradition”. 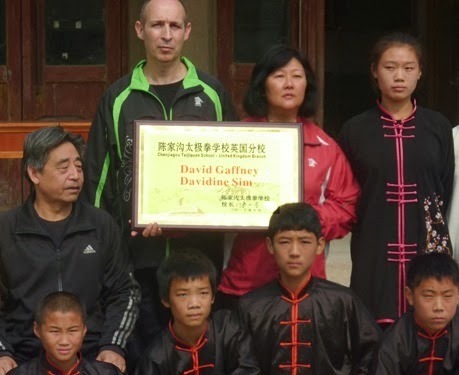 During one of our training trips to Chenjiagou someone asked about the “spiritual dimension” of Taijiquan. They were told that there are three reasons for training Taijiquan: first for training an individual’s strength, constitution and general health; second, on the basis of good physicality training for combat; finally, on the basis of the previous two aspects they could begin to talk about spiritual development. Over a lifetime’s training the committed Taijiquan practitioner embarks on a process of nurturing and cultivating or “xiu yang”. In The Taoist Body Kristofer Schipper describes xiu yang as the: “means to arrange, to smooth down any roughness or irregularities by repeating an action many times in harmony with the cosmic order, until perfection is achieved. The perfect and complete body is thereby nurtured, its energies strengthened; it thus becomes totally integrated into the natural and cosmic environment. From there, the way is led – by repeated, cyclical movements – to spontaneity, which is the essence of the Tao”. David, I think that "spiritual" depends on your definition of it, in comparison with the say "spirit" is defined in Asian "religions" (I don't think of them as being religions in the same sense we think of Christianity). Being a spiritual person is synonymous with being a person whose highest priority is to be loving to yourself and others. A spiritual person cares about people, animals and the planet. A spiritual person knows that we are all One, and consciously attempts to honor this Oneness. A spiritual person is a kind person." Asian religions tend to focus on the Xin/Shen/Shin as the core of the "spirit" or "spirituality". Establishing a rapport between the conscious mind (yi) and the Xin tends to be a goal of Asan religions. Notice, for instance, that the kanji character for "kami" (god) in Japanese is the same character for Shin, the subconscious mind. What I'm getting at is that in the article above, the description of steps might be better understood as a prescription for gradually harmonizing the conscious mind and the subconscious mind. Remember that developing jin is a first step in deliberately cultivating the Shen. I.e., jin is a crude form of Shen usage. Developing the "spirit" goes beyond that.